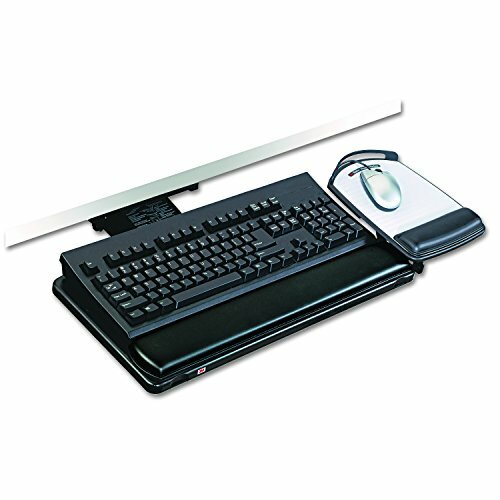 Highly adjustable keyboard platform features lateral adjustment, 6amp;quot; height range, 360 swivel and 10/-15 tilt. Lever handle ensures positive lock on platform height just flip lever to the right, adjust height and move lever back to lock in place. Separate pull lever for tilt adjustment. Independent articulating mouse platform can be mounted right or left. Patented leatherette gel wrist rests with antimicrobial product protection. Precise mousing surface extends battery life. Color: Black Workstation Type: 90 Corner Curved Diagonal Straight Height /- Desktop: .5amp;quot;/-5.5amp;quot; Keyboard Tray Dimensions W x D: 19 1/2amp;quot; x 10 5/8amp;quot;. The adjustable keyboard tray with lever-activated positive locking arm ensures the platform won't change height if accidentally bumped. Perfect for all workstations, fits both corner or straight-on workstations. Includes incredibly soft gel-filled wrist rests for mouse pad and keyboard, with a leatherette cover that last longer than fabric-covered wrist rests and is easier to clean. Perfect for all workstations, fits both corner or straight-on workstations.